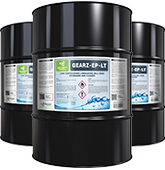 Specially formulated for ambient temperatures, GEARZ-EP-LT delivers high-quality cleaning and degreasing results even under heavy load. Fast working and easy to apply, it is tough on difficult-to-remove greases but protects gears by reducing the risk of galling. It’s also biodegradable and contains no chlorohydrocarbons, making it a greener and safer high-performance cleaning solution. Sprayed directly onto gear mechanisms without pre-heating, GEARZ-EP-LT can quickly deliver excellent results. Its fortified formula removes difficult lubricants (containing lithium or asphlatines or molybdenum disulfide) that can build up in gear teeth over time. Rinsing with a high pressure hot water wash and a dilute solution of a water based degreaser like WONDERSOL or WHYNOT leaves gears thoroughly clean, ready to perform as new. Is biodegradable and ozone-friendly, ensuring the minimal environmental impact and an overall greener cleaning solution. Removes asphaltic, molybdenum disulfide, lithium and crater greases from the roots of gear teeth more effectively. Keeps downtime to a minimum by cleaning mill gears while operating under load. Vapour emissions, odour levels, and fire and handling hazards are all reduced making the working environment safer. Helps lower maintenance costs by reducing likelihood of galling or scarring gears. GEARZ-EP-LT is now available directly from Velocity Chemicals, with orders shipped to anywhere in North America within 24 hours. To order, call one of our specialists today at 604 881 4700.